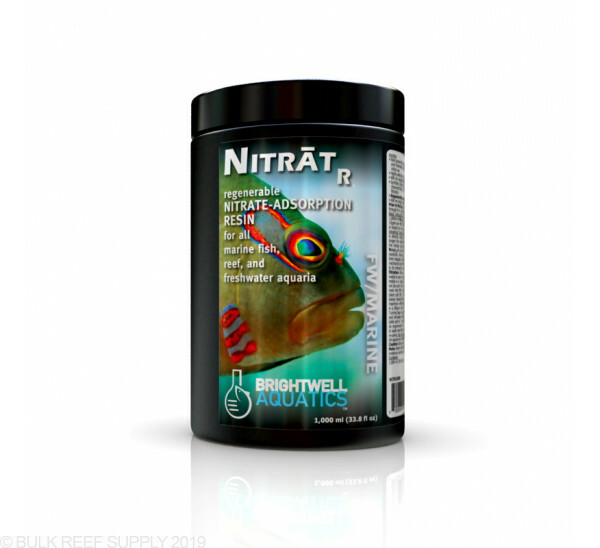 Next-generation regenerable nitrate adsorption resin effective in marine and freshwater aquaria; does not require soaking in buffered water prior to initial use. Will not negatively impact water quality, nor release nitrate once exhausted. Synthetic polymer resin beads provide for durability and excellent flow characteristics; may be employed in fluidized-bed, canister, or passive filtration. Will not impact alkalinity in aquaria as some competing products may. Prior to first use, rinse each 500ml of resin by passing 4 quarts of fresh water through it in a steady stream; discard water once completed. To initially lower excessive nitrate, each 500ml of NitratR will remove 20ppm nitrate in 100 US-gallons of water (or 10ppm per 200 US-gallons). When nitrate concentration remains unchanged or begins to increase, regenerate as described below. To a point, effectiveness of resin is directly related to the reaction time it has with aquarium water; the longer the reaction time, the more effectively it will remove nitrate. 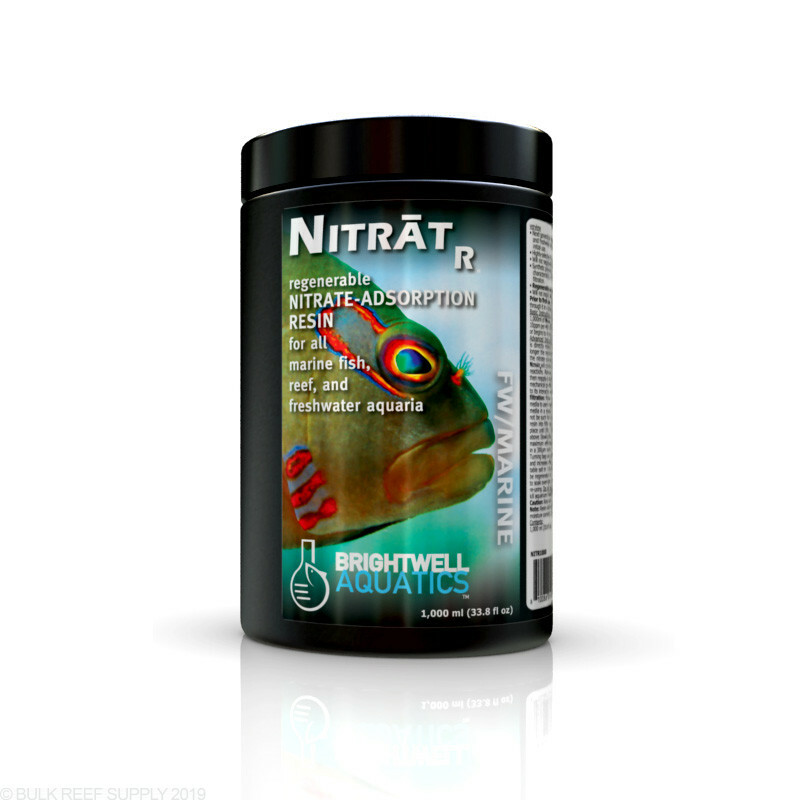 Once the nitrate concentration (”[NO3 -]”) reaches a nearly-immeasurable level, NitratR will continue to remove nitrate as it is produced in natural biological reactions. Remove and regenerate resin when [NO3 -] begins to increase, then reapply to facilitate continued nitrate removal. In all cases, the use of a mechanical pre-filter to remove particulate organic material from water prior to its interaction with this media will prolong effectiveness. Fluidized-bed filtration: follow instructions of filter manufacturer for optimal volume of media to use in reaction chamber; start at a low flow rate and adjust to keep media in a steady “churn” within lower 2/3 of chamber; flow rate should not be such that resin is ejected into aquarium. Canister filtration: Load resin into filter cartridge as directed by filter manufacturer; leave resin in place until [NO3 -] reaches desired level or remains unchanged, as directed above. Slowing the flow of water through the filter may be required to obtain maximum effectiveness of resin. Passive filtration: Place resin loosely in a 300μm mesh filter bag and locate in an area of lowto medium-flow. Turning bag over periodically during usage will serve to shift the resin beads and increases effectiveness of this method. Dissolve 4 cups table salt in 1 US-gallon of room-temperature water per 250-ml NitratR to be regenerated in a clean pail; place resin into pail and stir; allow beads to soak overnight; strain and rinse beads thoroughly in fresh water before re-using. Do not regenerate with bleach, which will damage resin and could kill aquarium inhabitants. Resin sold moist. Keep closed to prevent drying. Weight varies due to moisture content, therefore product is sold by volume rather than weight. Ran this product in a reactor slightly tumbling as directed. Nitrate never dropped. Water professional tested at aqua medic in Fort Collins Co and Nitrate stayed at 17PPM after two weeks of use. Just doesn't work. I learned the hard way. If you are going to run this in a reactor you have to use a filter mesh beg to hold the media. It is too small and will get through and back out of the reactor. :( I put it into a filter mesh bag and we will see how this goes. So far I don't see more of it getting pushed up to my display tank. I wish the product would have specifically spelled out that a filter mesh bag is need. I will now see how well it controls my nitrates. I purchased to run my water in my aging barrels through because I have Nitrate in my tap, 10-15ppm. Running this through a pipe via a pump (with the resin in bags inside the pipe) takes the water (30 gallons) down to 0 ppm in just a few hours! Absolutely perfect for what I was looking for. I have run 60 gal through it so far, it should last 5-7 days before needing a recharge.